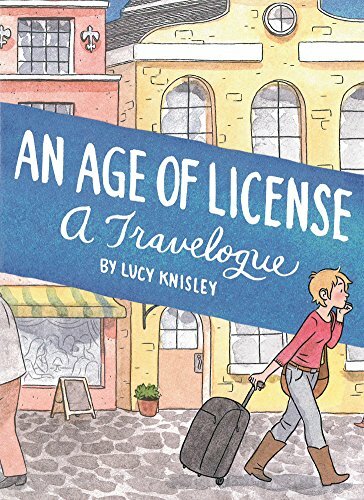 An Age of License is Lucy Knisley’s latest memoir/travelogue-thingy. It depicts an uncertain time in her mid-twenties, on a trip through Europe, and the discoveries she made about herself there. Let me just say first off: I adore Knisley’s work. French Milk is one of my very favorite graphic novels. Though I do not like to cook, I also adored Relish, her cooking memoir. The moment I heard that this book was coming out, I put myself on the hold list at the library. It came in to me last week. My thoughts on the book are, unfortunately, divided. On the positive side, I enjoyed the art and humor and the observations that Knisley made all throughout the book. On the negative side, I didn’t feel like there was as strong of a narrative arc to this one. I understand that this is, essentially, a journal – but so was French Milk. I felt like, as a book, An Age of License lacked focus in places. While it was fantastic as a collection of little stories – I did really love all the little tangents and meanderings – it didn’t, as a whole, have the same power as the first two I read. That’s not to say I didn’t like it. I did enjoy the book, as I said above, and I will continue to voraciously read Knisley’s future work. I just didn’t feel this one had quite as much brilliance as French Milk or Relish. This entry was posted in 2014, Adult, Visual and tagged humor, nonfiction. Bookmark the permalink. And here I am…still not reading French Milk. It’s just sitting there, staring at me.